BTW, 'Melissa The Singer' (not treated here?) is probably one of the best stories I've read for many years. An interesting and provoking review. Thanks. Speaking for myself, not for the reviewer, I would say that every story is a social document. It is a reflection of its time, of the conscious and unconscious biases and assumptions of the author and his or her culture, and is read through the filter of the readers' biases and cultures, as well as the literary genre and milieu in which both exist. Not only is it valid to make this kind of observation, but I would go so far as to say it is the critic's duty to point out when apparently unexamined stereotypes or biases lead to unpleasant possible readings of stories. Disclaimer: while I have not read this whole collection, I obviously very much like many of the stories in it. I edited/published some of them. 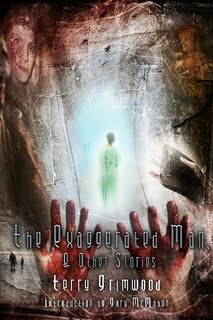 I've only just read the review of "The Exaggerated Man" and must say I was delighted, fascinated and disturbed by the way the reviewer actually saw the collection. I didn’t realise I was such a misogynist! She has a valid point however. I can't say that it was a conscious stereotyping of the sexes. I certainly don’t see women as monsters, in fact, I actually see them as stronger than us weak males. I wonder if it was an unconscious reaction to what I was going through at the time. My first wife was very ill and it was an illness where the physical, psychological and emotional blurred into a never-ending, lingering tragedy. Life had become a living hell for my wife and also for our children and myself. Inevitably that must have soaked into my writing because most of these stories were written around that time. In fact many of them are, on reflection, based or driven by that experience. "Chemo" most directly but the experience pervades the others to a greater or lesser degree. Interestingly, "Coffin Road" was written shortly after my first wife's untimely death and, on reflection, displays men as trying to maintain the dignity of one of their women by giving her a decent burial. The weak character is the woman's ineffectual, helpess widower. Was that the burial of my bitterness and pain and the beginning of a fresh start? Someone else will have to tell me because it is too difficult to properly examine the morass of feelings and confusion that surround that time in my life. Thank you very much for taking the time and energy to produce such an in-depth and carefully considered review. It has given me a lot of food for thought and will make me look more carefully at the way I portray the roles of the sexes in future work.